“We were in a predicament because we had had to come up with a solution to house high-tech audio equipment like amplifiers. We contacted an architect and he said this sounds like something Falcon can handle,” said Big House Sound Installation Director, Zach Richards. Left: Big House Sound needed to get audio to every Longhorns fan in UT’s spectacular Darrell K Royal-Texas Memorial Stadium. Right: Longhorns fan and Falcon President, John McAlonan and his wife Linda McAlonan understand what football means to Austin. Photos courtesy of John McAlonan. The equipment would support the speakers housed in the two towers above the 11,016 square-foot Jumbotron. 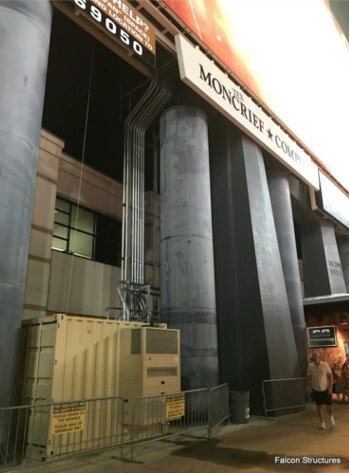 BHS required a prefabricated shelter that would protect and adequately cool the amplifiers and digital signal processors. Amplifying sound to reach over 100,000 fans creates a tremendous amount of heat that can impede or damage the equipment if not properly ventilated. Big House Sound needed an enclosure with two heavy-duty air-conditioners and custom utility openings for conduits. “When there’s only six games a year everything has to be flawless; failure is not an option,” said Richards. A 10-foot shipping container was not going to be quite large enough to house the components, so Falcon’s production team cut a 20-foot container down to an 11-foot container. Big House Sound had already selected the air conditioning units, so openings were cut and framed to meet those specifications. To provide easy access for equipment monitoring and maintenance, a personnel door was also installed. Throughout the production process, Richards regularly communicated with Falcon’s president and COO, John McAlonan, to ensure the container would have just the right specifications. Each day, McAlonan would send pictures from Falcon’s yard to Richards by text and email. 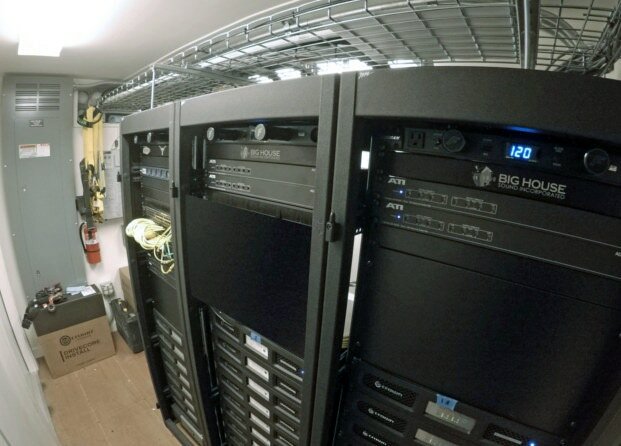 The equipment enclosure protects and air conditions Big House Sound’s amplifiers, and digital signature processors. Photo courtesy of Big House Sound. “We worked closely to ensure that we would have the appropriate ports as the conduit was installed. John did a fantastic job of getting everything updated,” said Richards. Falcon agreed to take on the project on a Friday, and had the containers loaded on the trucks for delivery the following Thursday. It was a record turnaround time. Although the Falcon Structures team appreciates having more than a week to complete a project, we’ll make an exception when the circumstances allow—especially when a Longhorns game is on the line. The equipment is protected in Falcon’s custom container-based shelter. In the end, BHS received their equipment enclosure—on schedule—and installed a spectacular sound system that Falcon’s own Longhorn fans rave about. “Now that we know shipping containers are available, we’d absolutely use them for any outdoor or portable enclosure. It’s cost effective and robust. Falcon’s customizations made installation a smooth and easy process,” said Richards. Falcon was happy to help, especially on a project that had special meaning to Longhorns fans. Each game where Falcon team members cheer in the stands, they’ll think about how they helped Big House Sound amplify their team’s spirit. 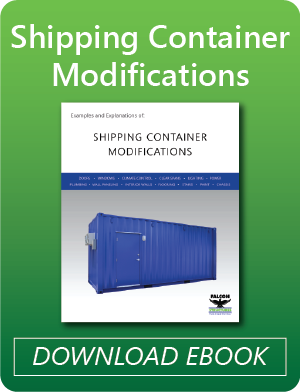 Need a modular shelter for your industrial equipment? We’re always happy to provide a free, no-obligation quote. Call us at 877-704-0177 send us an email at sales@falconstructures.com.